Description: Our “Breast Cancer Angel” Glass Cremation Keepsake Pendant is an optical clear pyrex glass pendant with a 3-D heavenly angel with a small amount of the cremains/ash in a clear window on the back of the angel. Once completed, I will sign the loved one’s first name or nick name, e.g. Dad, Mom, etc. on the back of the keepsake in 22k gold, so as to be Forever in Glass. 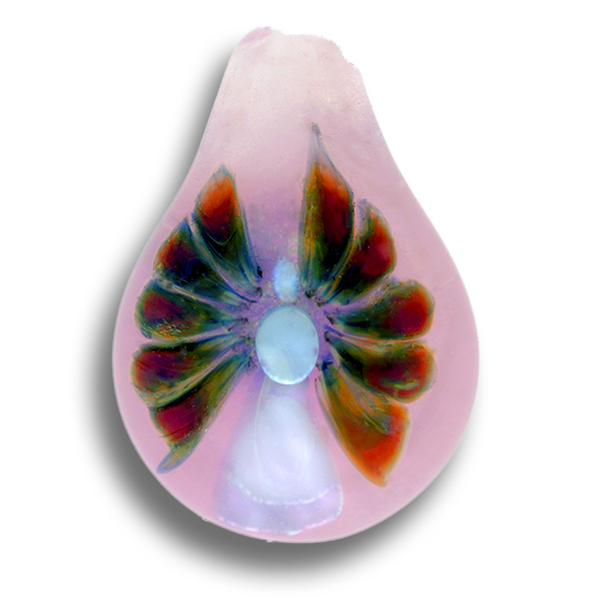 As the artist and creator of Forever in Glass, I am offering our newest keepsake as a symbol of hope as well as a symbol of remembrance. At the time when I lost my only sister Dianne to cancer at the age of 54, angels to me were a symbol of comfort, strength, and love. I dedicate the creation of my newest pendant to all the courageous women who have been affected by breast cancer. The fight goes on with hope and love. Available with or without cremains.